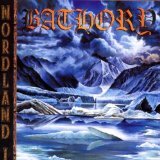 Nordland I is ranked 5th best out of 9 albums by Bathory on BestEverAlbums.com. The best album by Bathory is Under The Sign Of The Black Mark which is ranked number 4550 in the list of all-time albums with a total rank score of 380. Members who like this album also like: La Sanie Des Siècles - Panégyrique De La Dégénérescence by Peste Noire, Spirit They're Gone, Spirit They've Vanished by Avey Tare & Panda Bear and Sea Change by Beck. Related links: top tracks by Bathorytop tracks of the 2000s, top tracks of 2002.